COLORADO, USA — Spring has arrived in Colorado with bees, robins, bunnies and baseball. The grass is turning green and trees are blooming. Easter arrives Sunday, April 21, and dozens of Easter egg hunts are planned across the Centennial State, from Pueblo to Fort Collins, Grand Junction to Burlington. Here's a list of some of the Easter egg hunts we've found across Colorado in 2019. Do you know of an egg hunt in Colorado? Send it to alexander.kirk@9news.com and we'll include it right away. Arbor View Senior Community Easter Egg Hunt: Saturday, April 20 - Arbor View Senior Community will host an egg hunt from 9:30 a.m. to 10:30 a.m. Children ages 0-5 and 6 and up will hunt for eggs outside the apartments on the lawns near the front of the community and the Easter Bunny will make an appearance as well. Arvada West Middle School's Eggstravaganza: Saturday, April 13 - Arvada West's Eggstravaganza will begin at 9:30 a.m. with games, crafts and more. Bunny Breakfast and Egg Hunt: Saturday, April 6 - Apex Park and Recreation District will celebrate Easter on April 6 with an all-you-can-eat pancake breakfast at the Community Recreation Center at 9 a.m. An Easter egg hunt will begin at 11 a.m. sharp at the southeast portion of Stenger Sports Complex. Community Easter Egg Hunt: Saturday, April 13 - VistaChurch will host an Easter egg hunt at North Arvada Middle School at 1:30 p.m. sharp. There will be bounce castles, a balloon artist, face painter, plus candy and prizes. Mile High Vineyard Arvada Church: Saturday, April 20 - Mile High Vineyard Arvada Church is organizing an Easter egg hunt at Ralston Central Park from 10 a.m. to noon. RSVP on Facebook. Oak Park Easter Egg Hunt: Saturday, April 20 - House2House Real Estate is hosting a hunt at the Oak Park Pavillion starting at 10 a.m. The Easter bunny will be on hand for photos and over 1,000 eggs will be hidden. YMCA Easter Egg Hunt: Saturday, April 13 - The YMCA of Metro Denver's egg hunt begins at 9:30 a.m. at the Duncan Family YMCA on Elridge St.
Aurora Cultural Arts District Easter Egg Hunt: Saturday, April 13 - The whole family can hunt for eggs at different locations in the Aurora Cultural Arts District including ACAD Galleries and Studios, Peak to Peak Brewery, Florence Square Apartments, Pasternack's Pawn Shop, La Cueva Restaurant and the Martin Luther King Jr. Library. All Saints Lutheran Church Easter Egg Hunt: Saturday, April 20 – All Saints Luther Church’s Easter egg hunt is open to all ages preschool through 8th grade, starting at 10 a.m.
Church at the Creek Easter Egg Hunt: Saturday, April 20 – Church at the Creek’s annual Easter egg hunt starts at 9 a.m. Saturday at Vista Peak Preparatory Auditorium with over 2,000 eggs, music and fun. Eastern Hills Community Church Easter Egg Hunt: Saturday, April 20 and Easter Sunday, April 21 - Southeast Aurora's Eastern Hills Community Church will hold an egg hunt at 6 p.m. Saturday and 10 a.m. and noon on Easter Sunday. Mississippi Ave Baptist Church Easter Egg Hunt: Saturday April 20 - Mississippi Ave Baptist Church's egg hunt will take place from 2 p.m. to 4 p.m. with over 5,000 eggs, food, games and family fun. Trinity Baptist Church Easter Egg Hunt: Saturday, April 20 - Trinity Baptist Church will hold their hunt with 6,000 eggs at 10 a.m. at 15555 E. Quincy Ave. in Aurora. Calvary Bible Church: Saturday, April 20 – All are welcome at Calvary Bible Church’s Easter egg hunt, which takes place between 10 a.m. and noon, with snacks, games, crafts and special prizes. Easter EggsStravaganza: Friday, April 19 - Agape Kids' free, family-friendly event will have egg coloring, snacks, crafts and a pre-K Easter egg hunt. Barr Lake State Park Easter Egg Hunt: Saturday, April 20 – Barr Lake State Park will host a day of Easter fun with egg hunts, crafts, face painting, nature fun facts and more. Register online for the Easter egg hunts. Brighton Recreation Center Egg Dash: Saturday, April 13 – Bring your own basket to the Brighton Recreation Center for a free outdoor Easter egg hunt, set to begin at 12:15 p.m.
Northeast Elementary School Easter Egg Hunt: Saturday, April 20 - Northeast Elementary School will hold an egg hunt at 11 a.m. with bounce houses, hot dogs, face painting, raffle and more. Broomfield Eggstravaganza: Saturday, April 20 – The City and County of Broomfield’s Easter Egg Eggstravaganza will begin at 11:30 a.m. at the Amphitheater at Community Park. Bring your own basket and a camera! Broomfield Paws in the Park: Saturday, April 20 – After the Easter egg hunt, an egg hunt for dogs will begin at 3 p.m. at Commons Dog Park. There will be an Easter bonnet parade and photos with the Easter bunny. All friendly dogs are welcome. Special Needs Community Egg Hunt: Saturday, April 13 - Discovery Christian Church will hold five Easter egg hunts for children of all abilities, including traditional, wheelchair accessible, audible, quiet indoor and sensory. All ages and siblings are welcome at the event which begins at 10 a.m. There will also be a free hot dog lunch from 11:30 a.m. to 12:30 p.m.
Byers Park and Rec Egg Extravaganza: Saturday, April 13 - The annual egg hunt event in Byers will have crafts, vendors, face painting, carriage and pony rides, concessions and an appearance by the Easter Bunny. Tallahassee Fire Protection District Breakfast & Easter Egg Hunt: Saturday, April 13 - Celebrate Easter with the fire protection district starting with a 9 a.m. breakfast, followed by an Easter egg hunt at 10:30 a.m.
Douglas County Volunteer Expo: Saturday, April 13 - Castle Rock Bible Church Kids (CRBC Kids) will host an egg hunt at the Douglas County Events Center at 11:15 a.m.
Epiphany Lutheran Church Easter Egg Hunt: Saturday, April 20 - Epiphany Lutheran Church’s annual Easter egg hunt starts at 9:30 a.m. with crafts and the Story of Easter before the hunt. Journey Easter Egg Hunt: Saturday, April 13 – Journey Church is hosting their Easter egg hunt at Castle Rock’s Bison Park at 12:45 p.m.
New Hope Presbyterian Easter Egg Hunt: Saturday, April 20 - New Hope Presbyterian Church’s fun Easter egg hunt runs from 10 a.m. to 11:30 a.m. Outlets at Castle Rock Easter Bunny Breakfast: Saturday, April 20 – Head to the Outlets at Castle Rock from 8:30 a.m. to 10 a.m. in the food court for a Flippin’ Flapjacks breakfast with the Easter Bunny, family-friendly activities, face painting, photos and more. Special Egg Hunt: Saturday, April 13 – The 4th annual Special Egg Hunt, hosted by Front Range Kids, is designed for kids of all ages, including those with special needs. There will be hunts for the hearing, vision, and mobility impaired, as well as age-speciﬁc traditional egg hunts. Register online. Encounter Church Easter Egg Hunt: Saturday, April 20 - Encounter Church will host an egg hunt with over 5,000 Easter eggs. There will also be bounce houses, face painting, food and lawn games. The event is free and begins at 10 a.m.
Family Sports Dome Egg Scramble: Saturday, April 20 – A free Easter egg scramble for children up to 12 runs from 8:30 a.m. to 11 a.m., rain or shine, at the Family Sports Dome on Peoria. Chocolate Bunny Walk & Egg Hunt: Saturday, April 20 - Bear Creek Nature Center and Fountain Creek Nature Center's event offers children the chance to meet a live rabbit, learn about rabbits and hunt for eggs in the woods. Reservations required. Church at Briargate Easter Egg Hunt: Saturday, April 20 - Church at Briargate’s Easter egg hunt is free and open to the public at 1 p.m. at John Venezia Community Park. Colorado Springs Flea Market Easter Egg Hunt: Saturday, April 20 - The Colorado Springs Flea Market will host a free Easter egg hunt for kids under 12 beginning at noon. Deerfield Hills Community Center Easter Egg Hunt: Saturday, April 20 - Deerfield Hills Community Center will have a huge Easter egg hunt with more than 30,000 eggs, bounce houses, face painting and more at 11 a.m. Element Christian Church Easter Egg Hunt: Saturday, April 20 - Element Christian Church’s fun-filled Easter egg hunt will be held at Fox Run Park’s Pavillion #5 at 3 p.m.
Evergreen Cemetery Easter Egg Hunt: Saturday, April 20 – All ages are welcome at 10 a.m. at Pikes Peak Hearse Association’s annual Easter egg hunt at Evergreen Cemetery in Colorado Springs. Heritage Baptist Church Easter Egg Hunt: Saturday, April 20 – Heritage Baptist Church’s annual Easter egg hunt starts at 10 a.m. for children ages 1 to 12. Mt. Carmel Veterans Service Center Easter Egg Hunt & Service: Saturday, April 13 – A family Easter egg hunt and service begins at 11:30 a.m. at Mt. Carmel Veterans Service Center. Pikes Peak Harley-Davidson Easter Egg Hunt: Saturday, April 20 – The whole family is invited to Pikes Peak Harley-Davidson's Easter egg hunt with a cookout, candy and prizes planned from 10:30 a.m. to 2 p.m.
VillaSport Athletic Club & Spa's Great Egg Hunt: Saturday, April 20 - The Great Egg Hunt will begin at 11 a.m. sharp and is complimentary for all VillaSport children. Widefield Community Bible Church Egg Hunt: Saturday, April 20 - Widefield Community Bible Church's first Easter egg hunt begins at 10 a.m. sharp at 702 S. Quebec St. in Colorado Springs. Register here. WeeCycle's Easter Eggstravaganza: Saturday, April 13 - WeeCycle's annual event features an Easter egg hunt, prizes, giveaways, kids crafts and discounts. Copper Mountain Easter Egg Hunt: Easter Sunday, April 21 - Over 65,000 eggs will be hidden at "the world's largest Easter egg hunt" at Copper Mountain. There are free hunts for children, as well as adults. State Farm Easter Egg Hunt: Saturday, April 13 - The 3rd annual State Farm Easter Egg Hunt will have over 10,000 eggs and 3 Golden Eggs for grand prizes. The egg hunt begins at 10 a.m. sharp at Craig City Park. Berkeley Easter Egg Hunt: Saturday, April 20 – The community is invited to Berkeley Lake Park for an Easter egg hunt set to begin at 10 a.m. sharp. The Easter Bunny will be taking free photos at the park at 46th and Tennyson. Bunny Bolt 5K, 10K, Kid's Run & Easter Egg Hunt: Saturday, April 20 - The Bunny Bolt event at Sloan Lake Park features the Kids 1K Rabbit Rush, face painting, a balloon artist and a massive Easter egg hunt. Capitol Hill United Easter Egg Hunt: Saturday, April 13 - Kids living within the Capitol Hill United Neighborhoods boundaries can hunt for eggs, play games and meet the Easter bunny. Colorado Ladies of Lowriding Easter Egg Hunt: Saturday, April 13 - This 9th annual Easter egg hunt will take place at 1 p.m. at Sloan Lake. The District Shops at Cherry Creek: Saturday, April 20 - The District Shops will have fun activities and free giveaways from 10 a.m. to 2 p.m. and an egg hunt with eggs hidden all throughout the store beginning at 11 a.m. There will be plenty to keep the kids entertained while the adults shop the spring collections of 300 local artisans and small businesses. Galilee Baptist Church Easter Egg Hunt: Easter Sunday, April 21 - Galilee Baptist Church will hold a glow-in-the-dark egg hunt after Easter services around noon at 1091 S. Parker Rd. Lowry Beer Garden Easter Egg Hunt: Saturday, April 20 - The annual Lowry Beer Garden Easter Egg Hunt will begin at 10 a.m. sharp. The neighborhood event will also have breakfast burritos, pancakes and drink specials. Mile High Flea Market: Saturday, April 20 – The Easter Bunny will stop by the Mile High Flea Market’s annual Easter egg hunt starting at 10 a.m. There will be food, prizes, candy and more. Register online. Montclair Community Easter Egg Hunt: Saturday, April 20 - This free event for Montclair neighbors begins at 10 a.m. at Montclair Park. Green Valley Ranch Easter Egg Hunt: Saturday, April 13 – This free Easter egg hunt in Green Valley Ranch will have over 10,000 eggs. The hunt starts at 9 a.m. sharp at Town Center Park near the baseball field. Afterward, there will be a beer garden with brunch and special activities including face painting, balloon making and a bubble station. Highlands Lutheran Church: Easter Sunday, April 21 - Highlands Lutheran will host an Easter egg hunt after their Easter Sunday service. Hope Crossing Church: Easter Sunday, April 21 - Hope Crossing Church will host an Easter egg hunt after their Easter Sunday service. Our Lady of Mount Carmel Catholic Church: Saturday, April 20 - The egg hunt will begin at 10 a.m. sharp. RSVP online. Park Hill United Methodist Church Easter Egg Hunt: Saturday, April 20 - This annual Easter egg hunt will begin at 10 a.m. sharp on Forest Parkway south of Montview Boulevard. True Life Church: Easter Sunday, April 21 - True Life Church will host an Easter egg hunt after their Easter Sunday service with a bounce house, food and dessert trucks, lawn games, photo booth, caricature artist and more. Regis University Easter Egg Hunt: Saturday, April 20 - The annual egg hunt at Regis University starts at noon at the North Boettcher Commons with prizes, cookie decorating and more. Rueth Team Easter Egg Hunt: Saturday, April 13 - Nicole Rueth and The Rueth Team are hosting an Easter egg hunt at Denver’s Fleming Mansion at noon with games, sack races, treats, face painting and more. Stapleton Egg Scramble: Saturday, April 13 - Stapleton's annual Easter event begins at 10 a.m. at Runway 35 Park. There will also be photos with the Easter Bunny, food trucks and more. Englewood Adult Easter Egg Hunt: Friday, April 19 – Adults can come dressed in their Sunday best or bunny outfits from 6 p.m. to 10 p.m. to search participating businesses for candy, discounts and freebies. If you stop at all the businesses, you’ll be entered into a Grand Easter Basket contest. Aspen Ridge Church MOPS Hop Easter Egg Hunt: Saturday, April 20 - The annual MOPS Hop event, with Easter egg hunt, brunch and fun activities, will begin at 10 a.m. at Aspen Ridge Church. Buchanan Park Recreation Center Easter Egg Hunt: Friday, April 19 – Evergreen Park & Recreation District is hosting a fun Easter egg hunt in the pool at Buchanan Park Recreation Center. Wear swim suit and bring goggles if needed, also bring a basket/plastic bag to collect eggs found in the pool. District residents pay just $2.50 per family and non-district residents pay $5 per family. Evergreen Elks Lodge Easter Egg Hunt & Free Breakfast: Saturday, April 20 - Evergreen Elks Lodge is set to hold their 12th annual Easter egg hunt from 8:30 a.m. to 11 a.m. at 27972 Iris Drive. All ages are welcome at the free breakfast and be sure to bring your camera for photos with the Easter Bunny. Purpose Church Eggstravaganza: Saturday, April 20 - Purpose Church welcomes all young children and their families to their annual Eggstravaganza. There will be a festival and games, along with the egg hunt at 9993 CR 11 (Corner of Birch and Sable) in Firestone. Fort Collins Circus Center's Celebrate Spring: Saturday, April 20 - There will be three Easter egg hunts at Fort Collins Circus Center, as well as an obstacle course. Fort Collins High School Easter Carnival: Saturday, April 13 - Fort Collins High School's annual National Honors Society Easter Carnival offers fun games, Easter egg hunts for all ages, face painting, and prizes. Admission is $4 per person or any two food cans that will be donated to the Food Bank (with a maximum of $10 per family). All proceeds benefit The Fort Collins Food Bank and the Leukemia and Lymphoma Society. Windsong at Rock Creek Easter Egg Hunt: Friday, April 19 - Windsong at Rock Creek will host the Easter Bunny and an Easter egg hunt at 10 a.m. The hunt is open to the public, but RSVP at (970) 372-5838. Crossroads Church: Saturday, April 20 – An Easter egg hunt at Crossroads Church’s Fort Lupton campus will begin at 10 a.m.
Fort Lupton Recreation Center: Saturday, April 13 – An Easter egg hunt at Fort Lupton’s Community Center Park will begin at 10 a.m. sharp south of the recreation center. Drifter’s Hearts of Hope Easter Egg Hunt: Saturday, April 13 – Non-profit Drifter's Hearts of Hope will host their Easter egg hunt and open house from noon to 2 p.m. RSVP online. Town of Frisco Easter Egg Hunt: Easter Sunday, April 21 - The Easter Bunny will hide over 5,000 eggs throughout the Frisco Historic Park and the Frisco Town Hall areas. The egg hunt will begin at noon when the Easter Bunny rings the historic schoolhouse bell. Victory Life Church Easter Egg Hunt: Saturday, April 20 - Victory Life Church's pancake breakfast begins at 9 a.m., followed by age-divided egg hunts and special needs egg hunt. 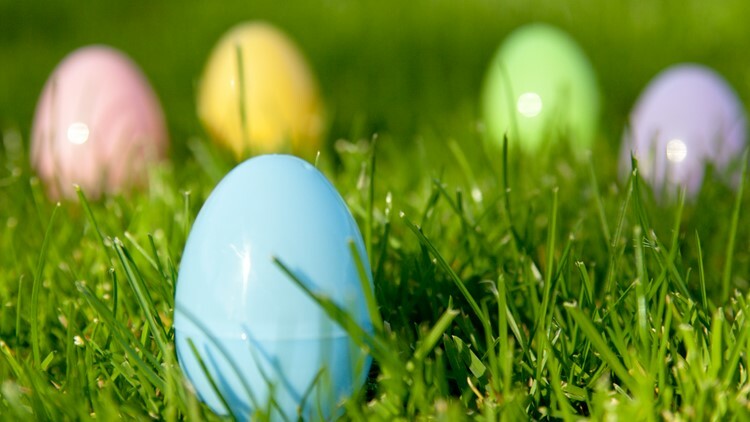 Georgetown Parks Easter Egg Hunt: Saturday, April 20 - Join the Clear Creek Library District at Werlin Park and Fosters Place for two Easter egg hunts. Both parks are along Taos Street – between 10th and 11th – in Georgetown. Ages 0-5 will hunt at Werlin Park and ages 5 and up will hunt at Fosters Place. Loveland Ski Area's Amazing Giant Easter Egg Hunt: Easter Sunday, April 21 - Join Loveland Ski Area on Easter Sunday for a spring skiing Giant Easter Egg Hunt at the Basin area (first chair at 8:30 a.m.) Keep your eyes peeled for the giant hidden Easter eggs as you ski down the slopes, browse the Sport Shop, and wander the base area. Huge eggs mean huge prizes such as skis, snowboards and other awesome prizes. Easter Eggstravaganza: Saturday, April 20 - This Easter Eggstravaganza will take place at Infinity Park at 10 a.m. sharp. The Easter Bunny will be taking photos as well. Avalanche Harley-Davidson Easter Egg Hunt: Saturday, April 20 – Stop by Golden’s Avalanche Harley-Davidson for food, drinks and a massive Easter egg hunt all over the dealership at 11 a.m. Prospect Rec & Park Easter Egg Hunt: Saturday, Apri 20 – Prospect Recreation & Park District’s Easter egg hunt will begin at 10 a.m. sharp at Golden’s Maple Grove Park. Bookcliff Easter Egg Hunt: Saturday, April 20 - Bookcliff Baptist Church's annual Easter egg hunts are free and open to the public at 10 a.m.
Cross Orchards Historic Site Easter Egg Hunt: Saturday, April 20 - The Easter Bunny will be at the Cross Orchards Historic Site for the 10:30 a.m. egg hunt. Eagle Ridge of Grand Valley Easter Egg Hunt: Saturday, April 20 - Eagle Ridge of Grand Valley's egg hunt will begin at 2:30 p.m. with eggs, candy and prizes. Golf Club at Redlands Mesa Easter Brunch & Egg Hunt: Easter Sunday, April 21 - The Golf Club at Redlands Mesa is ready to celebrate Easter Sunday with an all-you-can-eat brunch at 9 a.m., followed by an egg hunt at 10 a.m.
Mesa View Easter Egg Hunt: Saturday, April 20 - Solstice Senior Living at Mesa View's annual Easter egg hunt is set for 2 p.m. on the community's back lawn. Western Colorado Botanical Gardens Easter Egg Hunt: Saturday, April 20 - The Easter egg hunt at Western Botanical Gardens will have more than 15,000 eggs and the Easter Bunny will stop by too, starting at 10 a.m.
Easter Egg Hunt at Bill Barrett Ranch: Saturday, April 13 – The Trakehner Days Easter Egg Hunt at Bill Barrett Ranch, presented by Colorado Therapy Horses, will hold Easter egg hunts beginning at 11 a.m. RSVP with kari@coloradotherapyhorses.com or (970)-702-3230. Greeley-Weld Habitat ReStore Easter Egg Hunt: Saturday, April 20 - Greeley-Weld Habitat ReStore’s Easter egg hunt begins at 9:30 a.m. followed by a customer appreciation sale with door prizes and refreshments. Journey Christian Church Easter Egg Hunt: Easter Sunday, April 21 - Journey Christian Church will hold its egg hunt at 10:30 a.m. at Lincoln Park in downtown Greeley following the Easter service at the Union Colony Civic Center. West Greeley Baptist Church Eggxtreme Easter Egg Hunt: Saturday, April 13 - West Greeley Baptist Church’s Eggxtreme Easter Egg Hunt, for children ages 2 to 12, is set for 10:30 a.m.
Belle Creek Pancake Breakfast & Easter Egg Hunt: Saturday, April 20 – Live Church hosts the annual Belle Creek pancake breakfast and Easter egg hunt at the Belle Creek Family Center YMCA starting at 8 a.m. Helicopter Egg Drop: Saturday, April 20 - Orchard Church will drop thousands of Easter eggs from a helicopter at Prairie View High School. There will also be face painting, food, photos with the Easter Bunny, bounce houses and more. Connections Church Easter Egg Hunt: Easter Sunday, April 21 - The annual egg hunt at Connections Church begins at 9 a.m. and will be followed by an Easter Worship Service. The free event for children through grade 5 will offer special prizes for the Golden Eggs, treats and coffee for everyone. All are welcome. Highlands Ranch Community Association Easter Egg Hunt: Saturday, April 20 – The community is invited to Northridge Park in Highlands Ranch for an Easter egg hunt set for 10 a.m. sharp., followed by an appearance by the Easter Bunny! Bunny Dip at the Clear Creek Recreation Center: Saturday, April 20 - The Clear Creek Recreation Center invites children and adults of all ages to dive into the pool and hunt for Easter eggs. Be sure to bring a plastic bag to collect eggs, wear your swimsuit and bring goggles if needed. The cost is just $2.00 a person. Elks Lodge Easter Egg Hunt: Saturday, April 20 - The Elks Lodge's spectacular fun, free Easter egg hunt at Courtney-Ryley-Cooper Park will begin at noon sharp. Be sure to arrive early as you don’t want to miss the start of the event. The Easter Bunny is also said to make a special entrance with help from the Clear Creek Fire Authority. Lawn Police Lawn Care Easter Egg Hunt: Saturday, April 20 - This first annual egg hunt will also have prizes, drawings and photos with the Easter Bunny. Bear Valley Church Easter Egg Hunt: Sunday, April 14 - Bear Valley Church's event is set for 4 p.m. with bounce houses, food and Easter egg hunts for preschoolers and elementary-age children. Colorado Christian University Easter Eggstravaganza: Saturday, April 13 - The annual event at Colorado Christian University features inflatables, concessions, a petting zoo, pony rides, crafts, games and an Easter egg hunt. Easter for Lakewood: Saturday, April 20 – Faith Mountain hosts Lakewood’s largest Easter egg hunt with 20,000 candy eggs, carnival games, bounce houses, a unique egg hunt, great prizes and the Easter Bunny. RSVP online for the 9 a.m. event. Inversion Community Easter Egg Hunt: Saturday, April 20 - The Inversion Community (401 W. Mineral Ave.) will host an egg hunt with games and food starting at 4:30 p.m.
NextGen Easter Egg Hunt Family Potluck: Saturday, April 20 - Mile Hi Church will host an Easter egg hunt at 10 a.m. with games, music, springtime activities and potluck dishes. Westwoods Community Church Easter Egg Hunt: Saturday, April 20 - This free community egg hunt will begin at 10 a.m. with prizes, games, food and family fun. Larkspur Easter Egg Hunt: Saturday, April 13 – The 43rd annual Larkspur Spring Fling and Easter Egg Hunt is set for 10 a.m. at Larkspur Community Park. Easter Egg Hunt at Cooper: Saturday, April 6 - Ski Cooper will fill thousands of eggs with candy for its annual Easter egg hunt at 9 a.m.
Town of Limon Easter Egg Hunt: Saturday, April 20 - The annual Town of Limon Easter Egg Hunt begins at Limon Town Hall at 11 a.m. The Easter Bunny will be taking photos at Hoffman Drug - Pharmacy - True Value from 9 a.m. to 11 a.m.
Ascension Lutheran Church Flashlight Egg Hunt: Sunday, April 14 - The Flashlight Egg Hunt begins at 6:30 p.m. for kids in grades 3 to 6. Bring your basket and flashlight for a free hunt in the dark. Ascension Lutheran Church Easter Egg Hunt: Saturday, April 20 - Ascension Lutheran Church's annual egg hunt begins at 10 a.m. for kids through the 2nd grade. The fun, free event includes an appearance by the Easter Bunny! Breckenridge Brewery Easter Egg Hunt: Easter Sunday, April 21 - This free annual Easter egg hunt kicks off at 10 a.m. at the Farm House Restaurant at Breckenridge Brewery. To RSVP for brunch and brews afterwards, call 303-803-1380. Chatfield Farms Easter Egg Hunt: Saturday, April 13 - The huge Easter egg hunt at Denver Botanic Gardens at Chatfield Farms will have more than 1,500 eggs, crafts, balloon artists, the Easter Bunny and a Pop Up Shop. The event is free, but RSVP online is appreciated. Dakota Ridge High School Community Egg Hunt: Saturday, April 13 - The egg hunts at Dakota Ridge begin at 9:30 a.m. and end at 11 a.m. There will be egg hunts for three different age groups, as well as complimentary food, beverages, games, activities and a bounce house. Deer Creek Church Eggstravaganza: Saturday, April 20 – Littleton’s Deer Creek Church is hosting a free event for the whole family with Easter egg hunts, petting zoo, bounce house, face painters, cotton candy, snow cones, popcorn, balloon artist and more. Excel Taekwondo Spring Carnival & Egg Hunt: Saturday, April 13 - Excel Taekwondo's egg hunt will begin at 1 p.m. The spring carnival offers food, games, raffles, photo booth, the Easter Bunny and more. Jared's Nursery Easter Egg Hunt: Saturday, April 20 - Head to Jared's Nursery Gift and Garden Center for the 11th Annual Easter Egg Hunt, which last year had over 19,000 eggs. The free event for families begins at 10 a.m.
Ken-Caryl Ranch Easter Egg Hunt: Sunday, April 14 - The annual egg hunt hosted by Ken-Caryl Ranch begins at 11 a.m. at Ranch House Park with thousands of eggs, raffle prizes, crafts and the Easter Bunny. St. James Presbyterian Church Easter Egg Hunt: Saturday, April 20 - The Easter egg hunt at St. James Presbyterian Church (at the northwest corner of Belleview and Lowell) begins at 10 a.m. and is free and open to the public. Valley View Christian Church Easter Egg Hunt: Saturday, April 20 - Valley View Christian Church will hold an egg hunt following its 4 p.m. service. The free event will have a bounce house, egg hunt for the kids, egg toss for the adults and food for all. Woodmar Square Park Easter Egg Hunt: Sunday, April 14 - The 8th annual Easter Egg Hunt at Woodmar Square Park, hosted by Boston Terriers of Colorado, takes place from 11 a.m. to noon. Bring your own basket and be ready for photos with the Easter Bunny as well as games for kids and dogs. Easter Egg Hunt and Festival: Saturday, April 20 - White Fields Community Church will host the largest Easter egg hunt (and festival) in Boulder County at Roosevelt Park, beginning at 10 a.m. sharp. There will be face painting, bracelet making, a puppet show, bounce house, obstacle course and other fun activities. Great Easter Egg Drop: Saturday, April 20 - Village at the Peaks and Mile Hi Skydive will team for The Great Easter Egg Drop with free, family-friendly activities including skydivers, train, face painters, balloon artists, Easter crafts, games, music and the Easter Bunny. Longs Peak United Methodist Church Easter Egg Hunt: Saturday, April 20 - Longs Peak United Methodist Church will hold its Community Easter Egg Hunt at Hover Park from 2 p.m. to 4 p.m.
Saddleback Golf Club Easter Egg Hunt: Easter Sunday, April 21 - Saddleback Golf Club will have an Easter Sunday brunch at 9 a.m., followed by a free egg hunt at 11 a.m. Reservations are recommended by calling 303-833-5000. Community Easter Egg Hunt: Saturday, April 20 - Bent Tree Church’s community Easter egg hunt includes a giant egg hunt, carnival games and free food for the whole family. The fun gets started at 11 a.m. at Centennial Elementary School. South Loveland Community Eggstravaganza: Saturday, April 13 - Calvary Church Derby Hill hosts the South Loveland Community Eggstravaganza at 10 a.m. with egg hunts, coffee, games, train rides, food and door prizes. Zippity Zoo Barnyard Easter Egg Hunt: Saturday, April 20 – Easter egg hunts will begin at 10 a.m. and noon at Loveland’s Zippity Zoo Barnyard with farm animal meet-and-greets and photo opportunities. Register online. 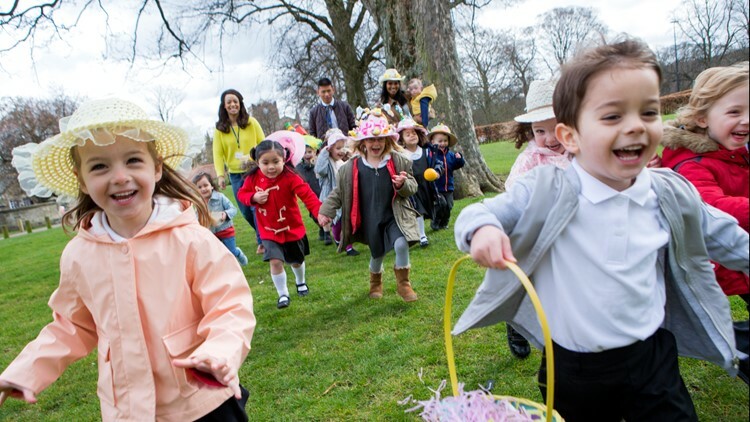 Miramount Castle Victorian Easter Tea & Egg Hunt: Saturday, April 20 - Head to Manitou Springs' Miramount Castle for a three-course Easter Tea in the Queen's Parlour Tea Room, while the kids hunt for eggs in the historic castle. Reservations should be made by calling 719-685-1011. Crossroads Church: Saturday, April 13 - Easter egg hunts at Crossroads Church’s Northglenn campus will begin at 3 p.m. and 4:30 p.m.
Dex's Depot 2nd Annual Easter Egg Hunt: Easter Sunday, April 21 - The Easter Sunday egg hunt at Dex's Depot has added age groups so that all kids will have a great opportunity at collecting several eggs. The Easter Bunny will also be appearing at the hunt. Easter at Thrive: Saturday, April 20 & Easter Sunday, April 21 - Thrive Church will hold an egg hunt at 3 p.m. and 5:30 p.m. on Saturday, April 20 and at 9 a.m. and 11 a.m. on Easter Sunday. The egg hunts will feature over 20,000 candy-filled eggs and four worship experiences. The event is free for the entire family. Lea Gonzales Park Easter Egg Hunt: Saturday, April 20 - Pueblo Christian Center's annual hunt will include 20,000 eggs, giveaways, bounce houses and visits from Mr. and Mrs. Easter Bunny starting at 10 a.m. at Lea Gonzales Park. Outpost Harley-Davidson Easter Egg Hunt: Saturday, April 20 – Pueblo's Outpost Harley-Davidson's annual Easter egg hunt will be moved outdoors this year and gets underway at 9 a.m.
Rise and Shine 5K Fun Run and Easter Egg Hunt: Saturday, April 20 - After the 1st annual Rise and Shine 5K Fun Fun on Saturday, a free children's egg hunt will begin at 10 a.m. at Pueblo City Park. Rosemount Museum Easter Egg Hunt: Saturday, April 20 - Rosemount Museum’s annual Easter egg hunt takes place at 11 a.m. For more information or to book a tour, call (719) 545-5290. Underwater Easter Egg Hunt: Thursday, April 18 - Salida Recreation and Hot Springs Aquatic Center will let kids swim for their Easter eggs to win prizes and toys by collecting the golden eggs. Easter Worship Service and Easter Egg Hunt: Easter Sunday, April 21 - First Presbyterian Church will have an Easter Egg Hunt and Fellowship Coffee at 9 a.m. and Easter Celebration Worship Service at 10:30 a.m. All are welcome. Crossroads Church: Saturday, April 13 - Easter egg hunts at Crossroads Church’s Thornton campus will begin at 9:30 a.m. and 11 a.m.
Easter Egg Scramble: Saturday, April 20 - The City of Thornton's Egg Scramble begins at 10 a.m. sharp at Community Park at Thornton Parkway and York Street. Arrive early because the eggs go fast! Missiongathering Christian Church Easter Egg-Stravaganza: Saturday, April 13 –Missiongathering Thornton hosts an Easter Egg-Stravaganza at Eagleview Park across from Eagleview Elementary at 11 a.m. with over 1,000 eggs, bounce house, crafts, games, prizes, drawings, food, drinks and candy. Harvest Farm Easter Egg Hunt: Saturday, April 20 - The annual Easter egg hunt at Harvest Farm begins at 1 p.m. There will also be face painting, games, snacks and an appearance by the Easter Bunny. Adult Easter Egg Hunt: Saturday, April 13 - The Easter Egg Hunt at Walnut Creek Golf Preserve is not for the kids. The event offers two egg hunts, egg toss, egg races, carrot toss, a "peep show," most outrageous Easter bonnet contest, the Easter Bunny and more. Tickets can be purchased online. Easter Egg Hunt for Visually-Impaired Children: Saturday, April 13 - Legacy West Pioneers will hold a free Easter egg hunt for visually-impaired children at the Westminster Elks Lodge. Eggs with electronic sound devices will be hidden for visually-impaired children under the age of 18. Eggs will also be hidden for the sighted siblings. RSVP by emailing mywalker1@aol.com. Glow in the Dark Easter Egg Hunt: Friday, April 12 - The Crossing Church and Crossing Kids will host a Glow in the Dark Easter Egg Hunt Friday evening with over 5,000 eggs hidden in areas for different age groups. Harbor Church Easter Egg Hunt: Saturday, April 20 - Harbor Church will host an egg hunt at the new downtown Westminster, located at Fenton and Park Place, at 10 a.m. sharp. There will be different hunts for different age groups as well as hot chocolate and coffee. Hyland Hills Easter Egg Hunt: Saturday, April 20 - The Easter Bunny will bring thousands of eggs with candy to Carroll Butts Athletic Park at 10 a.m.
Westminster Elks Kids Easter Party: Saturday, April 20 - Westminster Elks 2227's Kids Easter Party includes an egg hunt and an appearance by the Easter Bunny. Wheat Ridge Easter Egg Hunt: Saturday, April 20 - The City of Wheat Ridge will host an egg hunt at Panorama Park at 10 a.m. sharp. Bring a basket! Journey Church Glow-in-the-Dark Easter Egg Hunt: Friday, April 19 - Journey Church at Windsor hosts a neat glow-in-the-dark Easter egg hunt with bounce houses, obstacle courses, inflatable games, snacks, photo booth and prizes from 7:30 p.m. to 9:30 p.m. Register online. St Alban’s Episcopal Church Easter Egg Hunt: Easter Sunday, April 21 - St Alban's Episcopal Church’s Easter egg hunt is set for 10 a.m. Easter Sunday. Timberline Windsor Easter Egg Scavenger Hunt: Saturday, April 13 – Timberline Windsor’s Easter egg hunt will be an open house-style event with egg hunting and food trucks from 11 a.m. to 2 p.m.
Do you know of an egg hunt we've missed? Send it to alexander.kirk@9news.com and we'll include it right away.